The Imogen Trager novels offer a compelling critique of the precarious state of democracy. Faithless Elector, which debuted in the spring of 2016, is a taut thriller about stealing the presidential election. Its central premise is the latent weaknesses and potential for abuse inherent in the Electoral College. The precise machinations envisioned in the book have not come to pass (thankfully! ), but the larger issues raised by the story remain. Meanwhile, current events expose the precarious, brittle state of democracy almost daily, as well as its impotency. The weaknesses exploited in Faithless Elector remain latent and prone to mischief…and there are others. Which sets up the second book, Dark Network (due out in October!). As a novelist, I’ve been able to explore these themes within the context of a pacy, compelling story about a search for truth and justice. Faithless Elector, and Dark Network are not narrowly about political parties, the weakness(es) of the Electoral College, or events which daily overwhelm the news cycle. They are about ordinary people battling powerful forces. The books (and the forthcoming Consent of the Governed) are about the precarious vulnerability of our democracy and its potential impotency in the face of decisive, ruthless, well-heeled interests. I’m not a political scientist. These are thrillers, not conference papers. What compels me as a novelist, are the characters, thrust into dangerous, extraordinary circumstances. “Governments are instituted among Men,” the Declaration of Independence reads, “deriving their just powers from the consent of the governed”. Taken together, the books shine a glaring light on how that consent can be twisted and negated–and what the emotional response of characters forced into action looks like. The books have never been about the rightness or fitness of one party or another, except insofar as the “bad guys” seem to be circumventing them. Parties are, after all, at least responsible and responsive to their constituents; and ideally, when a party no longer has our consent, they are voted out. Moreover, political parties are the only bulwark against self-dealing elites. The books appeal to readers on either side of our broadening political divide. I’m gratified that readers (see Amazon reviews) and independent reviewers have picked up on these broader themes of taut storytelling, dark forces, political accountability and personal responsibility, of the necessity for “ordinary” people to participate in the life of their nation. While the books can stand alone, the series is about what can happen when a tiny group seeks extra-democratic means to take control for their own benefit. In that way, the books may be more prophetic than even I imagined. You should see for yourself. 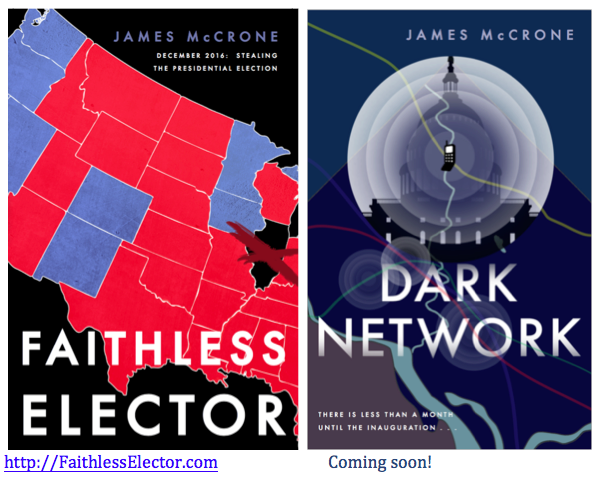 James McCrone is the author of Faithless Elector, a suspense-thriller. Publishers Weekly calls it a “fast-moving topical thriller.” Its “surprising twists add up to a highly suspenseful read.” The sequel, Dark Network, is coming in October, 2017. Faithless Elector, by James McCrone is available NOW through Amazon. This entry was posted in Politics, Writing and tagged DarkNetwork, FaithlessElector. Bookmark the permalink.